The summer months are all about holidays, camping trips, festivals and going to the beach. All equally fun and glorious to do but not necessarily the most hygienic of places when it comes to using the toilet. That’s where Femfresh comes in. 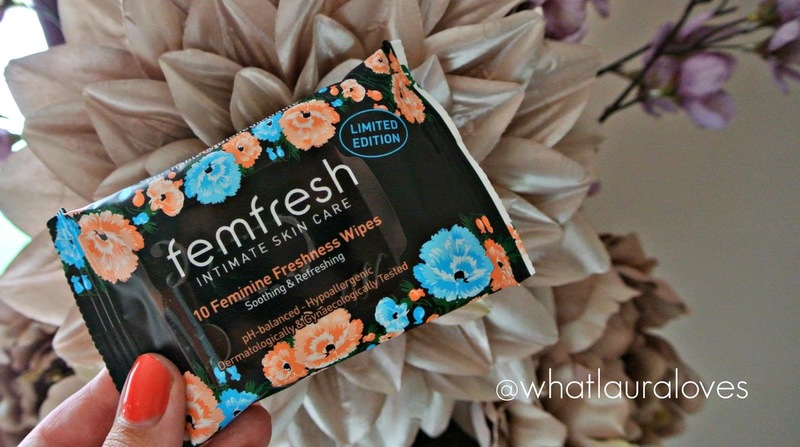 Femfresh have released two newly designed packs of their refreshing Intimate Pocket Wipes which are great for on the go use. The Feminine Freshness Wipes are gynaecologically and dermatologically tested and they’re super gentle so they are great for everyday use. They are pH balanced which makes them perfect for cleansing and refreshing intimate areas whether you simply want to freshen up after a long day or have just nipped to the loo. When its that time of the month, the Femfresh Feminine Freshness Wipes are an excellent choice to have with you too, alongside your sanitary protection of choice. The wipes are biodegradable and you can flush them so they’re great for keeping handy. The new designs are of a fresh, floral print and are limited edition for Spring/Summer 2014. Florals are always big business at this time of the year and I think its great that Femfresh have embodied this style in the design of their packaging with a white pack to represent the bright white of the day and a black pack like I have here to represent the bold confidence of summer nights. I love the design as they look pretty in my handbag and if I happen to drop a pack onto the floor then they’re pretty discrete and people wont know what they are at first glance. I’m sure most of us have had the embarrassment of opening our handbags and something like a tampon flying out so at least that wont happen with these! If you’re off on holiday this summer then a pack of these will come in vital to help you to stay fresh and clean after sitting on an aeroplane for hours and the same goes for if you’re at a festival, camp site or off to the beach for the day. There’s ten in each pack so perfect for a weekend away. Whenever I am going out at night, I like to put a pack of these into my clutch bag if I have the space. The packs are quite small and streamlined so they fit into the majority of my handbags without taking up a lot of space. They’re really convenient to use and an absolute godsend if you’re in the toilets of a packed bar that has run out of toilet roll. Femfresh have their own website here where you can check out their full range and get a £1 off coupon. If you’d like to purchase these wipes, they’re available from Boots and Superdrug and they retail for around £1.59 for a pack of ten.